"This is a cheap and easy way to make this Italian classic." Pour the marinara sauce into the slow cooker and set on High to warm. Combine the eggs and the breadcrumbs in a small bowl. Sprinkle both sides of the meat with salt and pepper. Pat the breadcrumb mixture over one side of the flank steak, leaving about a one inch border around edges. Top breadcrumbs with the bacon slices; sprinkle with shredded cheese. Starting from one long side, tightly roll flank steak into a log. Use string or toothpicks to secure the log in 4 or 5 places. Heat oil in a heavy skillet. Sear the stuffed flank steak in the hot oil until well browned on all sides, about 10 minutes. Transfer the meat to the warm sauce in the slow cooker. Spoon sauce over meat to cover. Turn slow cooker to Low; cook meat until very tender, 6 to 8 hours. Remove string/toothpicks before slicing. Serve with marinara. 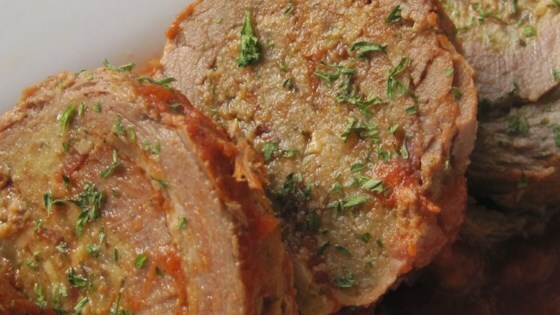 Make a classic Italian stuffed flank steak in the slow cooker.